F & W Well Drilling, Inc. has built a reputation for expertise and quality service amongst mid-Michigan customers. We’ve been a trusted well service provider since 1983, offering drilling and plumbing, well pump sales and service, water storage options and many other services designed to keep clean, safe potable water flowing in your home. Contact us 24 hours a day for service! Running water isn’t a convenience we often give much thought to… until you turn on the faucet and nothing comes out! When your potable water stops flowing or you’re having trouble with your well, get the problem handled quickly by the experts at F & W Well Drilling, Inc. We provide a complete range of services, designed to keep your well pump in Lansing, MI working at peak efficiency, delivering clean, safe water to your home. Whether it’s a flow rate problem, intermittent pressure or a failure of your pump altogether, we’re ready to get it fixed. And, if your pump is dead for good, count on us to sell you a replacement from a top-name brand that’s sure to serve you well. Need a completely new well drilled and plumbed, with a quality pump installed? Let us get your well up and running quickly! We provide complete services, backed by expert knowledge of the area’s water table. 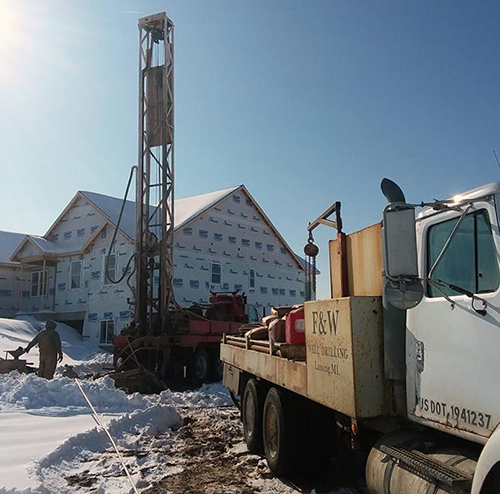 Whether it’s a residential, commercial or agricultural application, we’re ready to provide well drilling in Lansing, MI, as well as casing, pump installation and testing. Count on us for a huge breadth of other important services as well—including water treatment and storage, lightning repairs, insurance services and well decommissioning and abandonment, among others. Don’t let your well fall into disrepair or victim to recurring pump problems. We’ll make sure it’s always functioning at peak efficiency! We’re available 24 hours a day for emergencies! Call us at 517-484-0830 when your water is out and we’ll come out quickly to get it back on again. We’re a family-owned company. We understand that your water quality is critical to your family’s health and wellbeing, just like ours. We have over 40 years’ experience and use only top-quality products, guaranteeing best-in-class services for our customers and results that make us a leader for pump service. Count on us for insurance work. We can repair pumps and provide complete replacements. We always offer free estimates and consultations to customers. Our business is fully licensed and insured. Pump problems stopping you from getting the potable water you need? Need a new well drilled and plumbed? Our team of well experts is ready to deliver service to you! Contact us today.